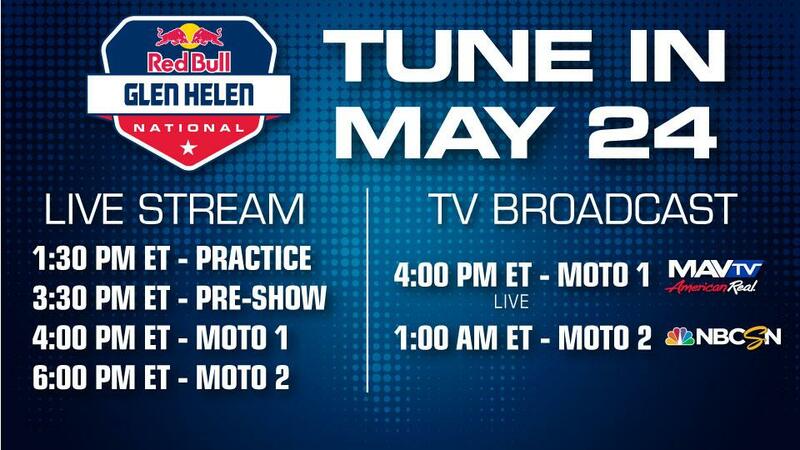 Don't miss the television or online coverage of the season-opening Red Bull Glen Helen National. Get the rundown below on how to watch practice, the exclusive online pre-show and all four motos on Saturday, May 24. If you miss a race, full replays will be archived on ProMotocross.com throughout the season. The second practice session will only be available online and viewable on our Live Extra page and Mobile App ( iOS / Android). New for 2014, ProMotocross.com presents an exclusive pre-show beginning a half-hour before the first moto at every round. You can watch it on our Live Extra page and Mobile App ( iOS / Android ). New for 2014, MAVTV will air the first motos of every round live. Use the MAVTV channel finder to see if you currently get MAVTV. You can also use the link to request that your cable provider carry MAVTV if they currently do not. The live stream of first motos can also be viewed online via the Live Extra page and Mobile App ( iOS / Android ). All seconds motos will air on either NBCSN or NBC this year. Most weeks, including Glen Helen, both of the second motos will be on NBCSN. Use the NBCSN channel finder to see if you currently get NBCSN in your area. The live stream of second motos can be viewed online via the Live Extra page and Mobile App ( iOS / Android ). Please note: In order to watch a live stream of an NBCSN broadcast, you have to verify your cable provider. Live Extra is a service offered through participating cable, satellite and telco TV providers that allows you to watch Motocross coverage of live events on the NBCSN. Don't see your provider? Contact your provider by clicking here to express your interest in receiving this service. Provide your email address and we will contact you once your provider has been added. We are actively working to add additional TV providers to this service, and recent additions include Cox, Charter and DirecTV. The 2nd practice session will only be available online and viewable on our Live Extra page and Mobile App ( iOS / Android ). The live stream of first motos can be viewed via the Live Extra page and Mobile App ( iOS / Android ). The Nationals will also be simulcast to various countries across the globe. Check the TV listings for your local station (listed above) for the time in your area. The live stream of second motos can be viewed via the Live Extra page and Mobile App ( iOS / Android ). The Nationals will also be simulcast to various countries across the globe. Check the TV listings for your local station (listed above) for the time in your area. A one-hour highlight show recapping the race will air in various countries across the globe. Check the TV listings for your local station (listed above) for the time in your area.